The Art Daily: VIEWS- Secretly Rebelling Souls in Strange Bodies - Parsis and Sidis of Sooni and Ketaki ..and more..
VIEWS- Secretly Rebelling Souls in Strange Bodies - Parsis and Sidis of Sooni and Ketaki ..and more..
JohnyML writes about the solo exhibitions of Sooni Taraporevala and Ketaki Sheth at the NGMA, New Delhi. National Gallery of Modern Art in Delhi is now like a forcefully reversed architecture. The old Jaipur House that used to face grandly at the India Gate is now the backyard of the architectural monstrosity that has become the new wing. To facilitate the free flow of visitors to the new wing, which in fact lays at the backyard of the old wing, has now diverted the traffic through a side gate. You feel some sort of displacement; may be out of habit. The new wing has everything in place; a ticket counter, a security entrance, a bag checking machine, a locker, an art shop for buying books and souvenirs, and a lot of works of art at different levels. Though the lighting is absolutely inadequate, of late the NGMA has achieved one thing; getting more visitors into its premises. One feels happy as he/she sees kids running around in the lawns, art students doing watercolours, lovers holding hands, families standing curiously in front of works of art, foreigners walking in even on a hot Sunday afternoon. 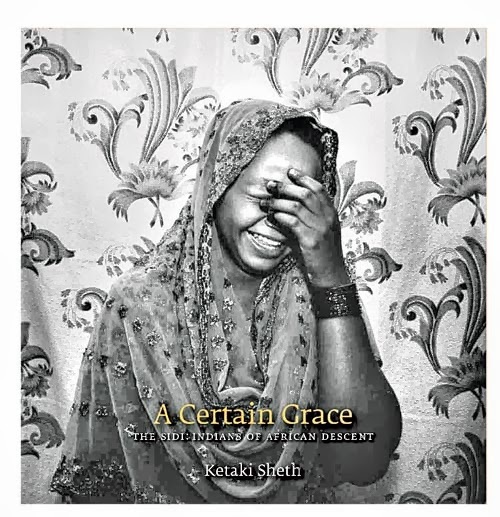 Inside the old building, this time you have two exquisite shows- Through a Lens, By a Mirror- Parsis by Sooni Taraporevala and The Sidi- Indians of African Descent by Ketaki Sheth. For both the artists, it should be a moment of pride as their works are shown at the prime national institution for modern art. Their decades-long researches and documentations look convincing and captivating. Sooni Taraporevala’s works are all about Parsis, a community that has been reduced to 65000 people in India (some Parsi insiders say, as seen in a documentary shown along with the exhibition, that their number is less than the official figures. It could be 50000 or even 30000). 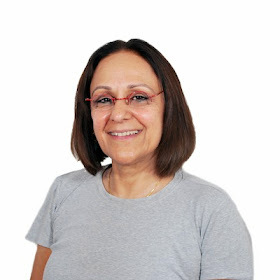 Taraporevala in her introductory note mentions that many people like her grandmother and grandfather are dead and gone but they remain as images. Ironically, the whole community is slowly disappearing. This sense of losing it had goaded her to train her camera at her own community almost 36 years back. 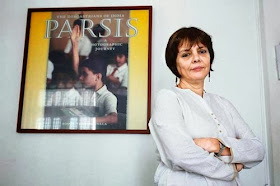 Today, it has become her mission and she has become an intimate name amongst the Parsi community in India. Perhaps, the outsiders know her more as a scriptwriter and a film maker, but for the Parsi community, she is the one who registers its thinning life fabric. Taraporevala does not make any clarion calls for change. Her photographs are not meant for inviting the governments’ attention to the community. Her registrations are more like diary writing, aesthetically appealing and poignantly touching. It is a struggle against forgetting and an underlining by remembering. She knows that there are various reasons for this community to perish. For a community that does not promote inter-marriages and also with men who prefer to remain bachelors for a longer period, the days of extinction are somewhere near. All over the world, the total population of Parsis are just about two lakhs. 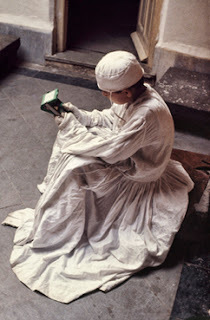 I had seen an edited version, perhaps the original, of the same show at the Chemould Gallery, Mumbai. I was struck by the aesthetic subtlety of those works. Each frame took the viewer in me into it. 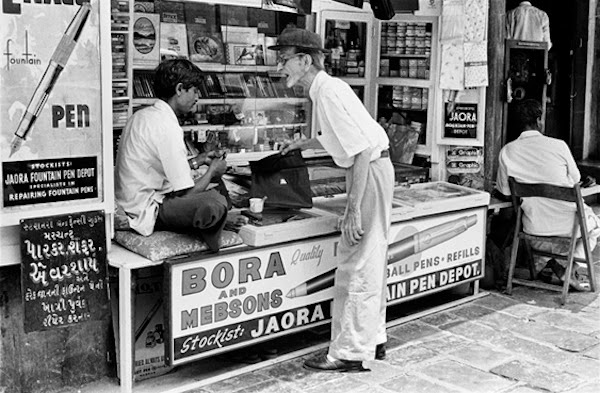 The fineness of execution, clarity of framing and even non-deliberation of moments seen in those works had made me an admirer of Taraporevala’s works. Now a bit more embellished exhibition is here in Delhi and it should be a visual feast for the Delhiites. 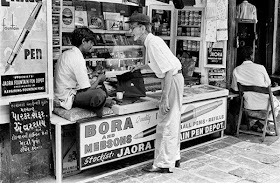 For those who look for aesthetic satisfaction would not go back without having it and those who want to know the history of the Parsi community and their socio-cultural presence in the places of our concentration also would go with the same satisfaction. I want Delhi art lovers to queue up for this show. On the left wing, you have Ketaki Sheth’s ‘The Sidi’. 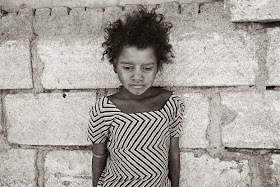 Sidis are the people of African descent who had come to Indian shores almost 500 years back. They came as merchants and workers. Some settled down here in Gujarat, Maharashtra and Andhra Pradesh. Much of a genetic mutation through inter-marriages has not happened in this community. So their African physiognomic traits remain more or less pure. They predominantly believe in Islam and also believe in other religions including Hinduism, Sikhism and Buddhism. They are racially different but are Indian citizens who speak Indian languages. As a Parsi gentleman in the documentary points out, however they try they cannot become ‘true’ Indians because they do not have a land. In Africa, Sidi’s are not welcomed as they are Indians; nor do they try to go back to their homelands as their homeland is India. So is the case of Parsis. This is another migrant community that has no fatherland; Iran no longer belongs to them. Seth’s documentation is touching. Standing at the information board with a text written by Ketaki Seth, I found one interesting omission. There is no reference to Islam/Muslim in that text at all whereas most of the people who have become the subjects of Seth’s documentation are Muslims as their names and contexts show. 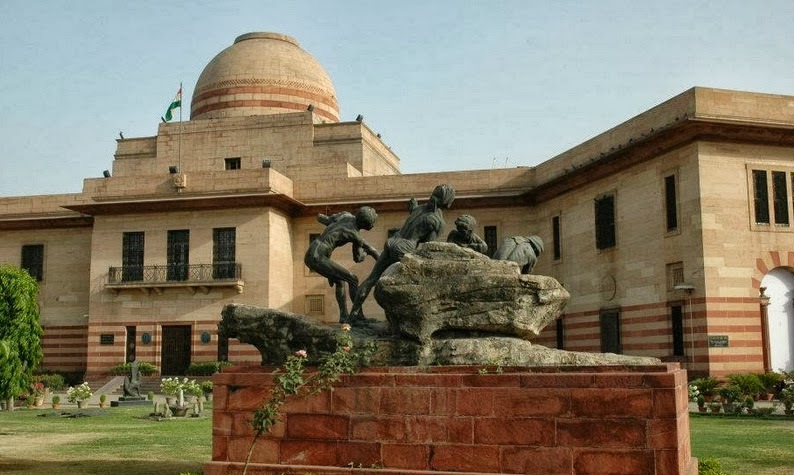 Was it a safe positioning of the NGMA Administration or it was a deliberate choice of the artist? What caused the omission of the word ‘Muslim’ from the wall text? The question disturbs me. Taraporevala does not shy away from making even ‘critical’ pictures. Is it because she belongs to the community and Seth does a project amongst the Sidis? I am worried about omissions, especially when I know that this section of the show is in collaboration with Photoink. In front of these works of both Taraporevala and Sheth, I felt some sort of an eerie feeling, which I had not felt when I saw the same show in Mumbai. I saw these characters and living people in their works as people living in strange bodies. Their minds belongs to a different climate and nature. Their bodies are caught in a strange land; Parsis and Sidis. According to our conventions of beauty, Parsis are fair, tall, long nosed and good looking people and Sidi, thick built, flat nosed, dark people. But suddenly they become one; one in their lost lands, in their memories, in their warring genes that refuse to obey though they accept the laws of the land. Again I say, everyone in Delhi should see these two shows; The Parsis and Sidis. 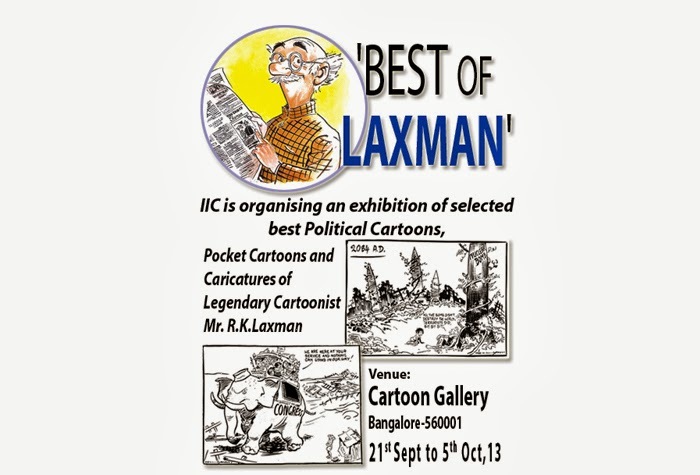 Indian Cartoon Gallery, Bangalore presents a treat for cartoon lovers with an exhibition of exquisite works of legendary cartoonist R K Laxman.The Indian Institute of Cartoonists has organized this exhibition of selected best Political cartoons, pocket cartoons and caricatures of Mr. R.K. Laxman. 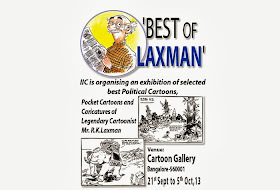 Born in Mysore and graduated from Maharaja College, R K. Laxman, has been the unofficial mascot of the Times of India and tickling the bones of readers for nearly five decades. Cartoons on the display are mostly of contemporary political and popular figures. The artworks of the master will be a rich visual experience for the viewers. The show is on view till 5th October 2013. Russian Centre for Science and Culture, Mumbai presents a unique show of three artists in a group, titled, ‘Pot Pourri’. 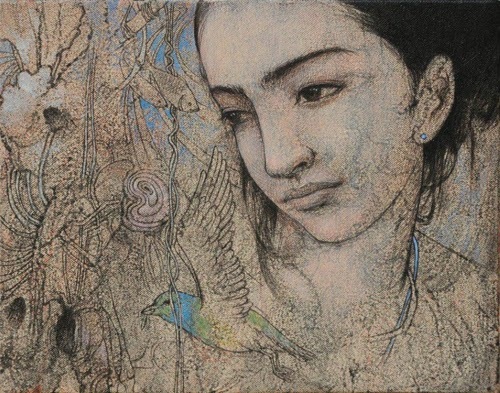 The show displays the works of three upcoming women artists, Mena Malgonkar, Minoti Gore and Rupali Gore. ‘Pot Pourri’ showcases different sizes of works and aims to recreate the magic of simple paintings. 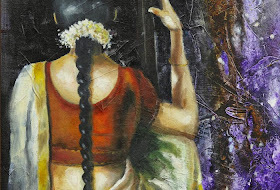 On display will be a myriad mix of landscapes, portraits, rendered in charcoals, oils and acrylics by Mena Malgonkar along with Minoti Gore and Rupali Gore, ardent art lovers. Without focus on specific mediums or subjects, Pot Pourri is a confluence of vivid expressions through the eyes of these artists. The show is on view till 29th September 2013. Alliance Francaise de Delhi, New Delhi presents an exhibition of photographs by photographer Oriane Zerah in a show titled, ‘Something about Hair’. Oriane Zerah is an independent photographer, represented by Wostok Press agency. She was born in Paris, where she followed Dramatic Art studies and dance. She has worked with comedian Jean-Pierre Leaud, and then during a few years in a Franco-Polish group before joining Theater du Soleil (1999-2001). 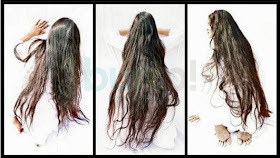 The show explores the significance of hair from a mythological, commercial, historical and geographical evolutionary stance. From human to animal to plant hair the artist captures her multitude of interpretations of hair through photography. The show is on from the 27th of September 2013 to the 11th October 2013. Idiyas Art Gallery, Bangalore presents a group show of art works, titled, ‘Melange of Milieu’. With a mixture of figurative and abstractions on display, the show brings something for every one. The participating artists include Prokash Karmakar, Ramananda Bandopadhyay, Sibsaday Chaudhuri, Shubamita Dinda, Gourango Beshai, Subrata Das, Shyamal Mukherjee, Sukanta Das, Samir Paul, Dilip Chaudhury, Ramratan Das, Basudev Pal Mazumdar, Shambu Saha amongst others. The show is on view till 10th of October 2013.